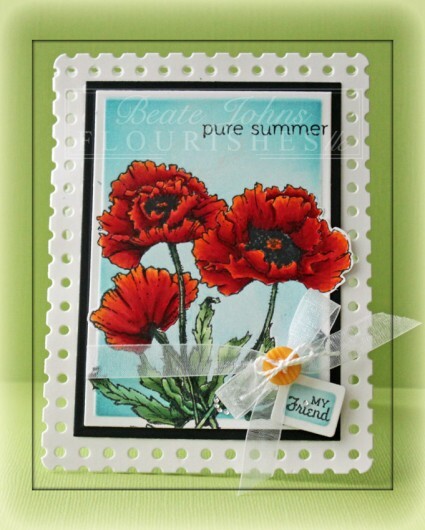 Today the Flourishes Design Team focuses on the stamp set Poppy Patch. For my sample stamped several images of that set in Tuxedo Black Memento Ink on white cardstock. It was cut and embossed with the third largest Card Creator Matting B Basics die and the Out of the Box technique. The image was colored with Copic Markers (YR04, R24, R29, R39, G20, G21, G24, G28) and sponged first with Tumbled Glass, then with Broken China Distress Ink. The image was adhered to black cardstock, cut and embossed with the third largest of the Matte A Basic dies. Ribbon was tied around the lower part of the layers. Another piece of white cardstock was cut and embossed with a Tailor-Made Classic Tag Template die. The center of the tag was sponged with Broken China ink and a sentiment from Passion Flower was stamped in it’s center. The tag was tied to the bow along with a button. The card base was cut and embossed out of white cardstock with the largest of the Card Creator Faux Postage dies. So gorgeous Beate! I always want to buy every single one of the dies you showcase!! Vibrant red poppies and such a pretty card Beate! Oh Beate — your card is absolutely stunning! Wow! I just love those gorgeous poppies. Poppies are one of those things I think you can never have too many of – either in the garden or beautiful summery cards like this! Awesome depth to your orangy-reds Beate! Love the rich vibrent colors of your Poppies and the contrast between the Poppy and the background. Beautiful as always. Beautiful coloring, Beate! I can practically see those poppies waving gracefully in the breeze. Oh Beate this is so gorgeous!! Love the brilliantly colored flowers and how they hang off the sides.. makes them pop right off the paper! You certainly know how to make an image come to life! Beautiful! Beautiful coloring, gives it a great richness, So Lovely! Beautifully coloured, and such perfect attention to detail, as always! This caught my eye in my inbox because I love poppies but they last such a short time in the garden. . . . This beautiful card made me think that you can make poppies last forever: just look at Beate’s art! Beautifully coloured, layered and finished – I don’t know a more precise, neater crafter than you! I fell in love with poppies when we visited Italy and every time I see them they make me smile. Such lovely memories! Thanks for making me smile with this gorgeous card! sigh… gorgeousness, girl! absolutely adore your coloring on this. i may have to pick up this set! =) love love your beautiful card, Beate! Another stunner Beate! I have say that all your cards make me wanna get my cardstock out and stamp & colour right away! Beautiful! 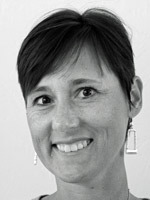 Just beautiful, Beate! Love the vibrance of your poppies! Just gorgeous! I love the deep rich red! Your poppies are stunning, Beate! Gorgeous card!